The life of Dr. J. Calvitt Clarke, one of the most influential men in the world of philanthropy, finally gets a proper telling in Fifty Years of Begging. Clarke’s grandson, educator and historian J. Calvitt Clarke III, notes that at his grandfather’s death in 1970, his obituaries were rife with errors and misconceptions – many created and perpetuated by Clarke himself during his lifetime. The book aims to set the record straight and present a more complete understanding of Clarke. The elder Clarke, who started as a Presbyterian minister and fundraiser for various charitable causes, is probably best known as the founder of the Christian Children’s Fund. Started in 1938 as China’s Children Fund, the organization provided food, shelter and education for Chinese children displaced by war. The organization took its mission to other countries and changed its name to the Christian Children’s Fund in 1951. Many of Clarke’s innovations – monthly sponsorships through which Americans “adopted” individual foreign children, the intertwining of religion and patriotism, long-term support for the children – were copied by other groups, making Clarke a true pioneer in the field. But that doesn’t give a full picture of the man. For example, under pseudonyms, he wrote dozens of romance, crime and adventure/fantasy novels. Clarke approached his religion skeptically, with little tolerance for hypocrites and hucksters, and his true feelings, the author writes, are revealed in the words and actions of his novel’s characters. Clarke did a magnificent job researching this book. He has made a thorough examination of Clarke’s papers, newsletters, correspondence, novels and other writings, and had access to archival material from various organizations Clarke directed. The writing is as solid as the research. The author makes what could be a dry rehash quite interesting and informative. Despite his relationship to his subject, he remains objective. 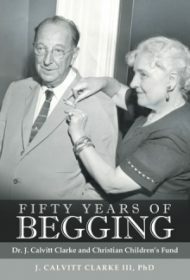 Anyone interested in the world of charitable giving, and how it developed over the last century, would do well to read Fifty Years of Begging.